Shooting movie stills in interior sets, with tungsten lighting, is very challenging, specially nowadays with the high sensitivity of digital movie cameras. I have been on several movie sets where the Director of Photography has lit the scene using only practical lights or a regular table lamp. I've had to set the ISO on my camera to over 6400 in order to capture an image, fighting digital noise in the process. Under these circumstances, the depth of field -effective focus range- is extremely narrow. If you focus on the eyes of the actor, the tip of the nose will be out of focus. But even in the best of circumstances- shooting in a photo studio with strobes, and setting the shutter speed of the camera at f22, it is impossible to keep the foreground and background in focus. If you focus on the eyes, the foreground will be out of focus. If you focus on the foreground, the whole face will be out of focus. 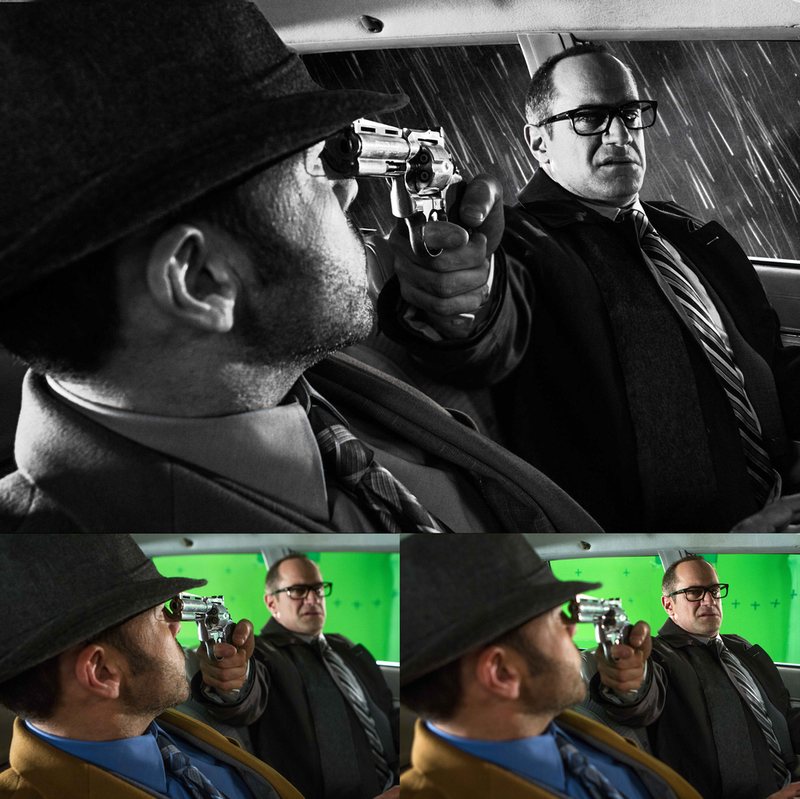 So I came up with a solution- take two quick shots, focused on the eyes of the actor and another on the foreground. Most of the time, the actor has no idea I am doing this, because I do it very quickly. 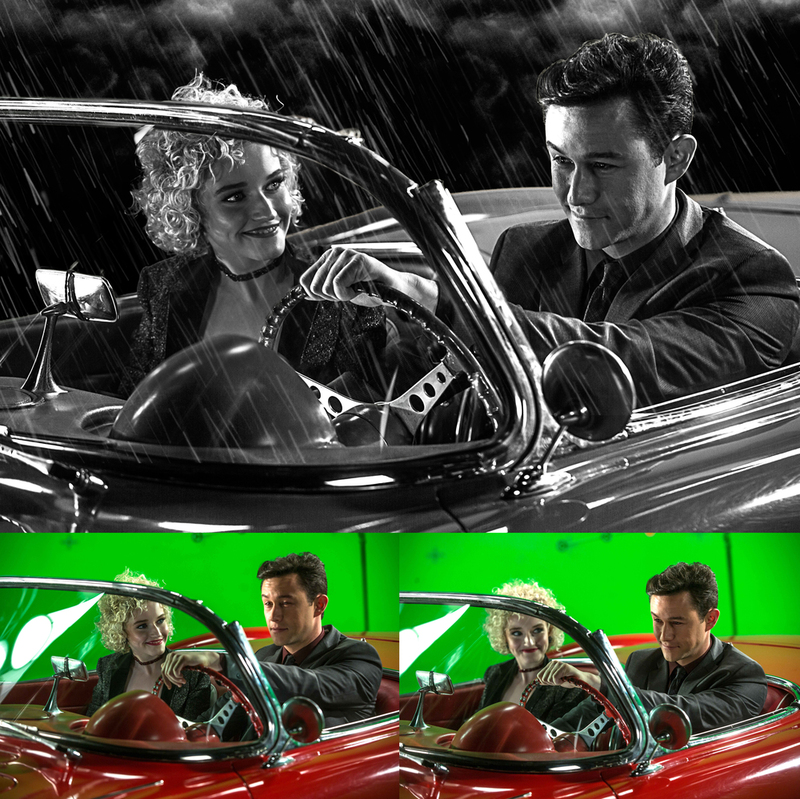 Doing this on the movie Sin City: A Dame to Kill For was easy, because most of the scenes were shot against a green screen. But this technique can be used effectively, and to great effect, on non-green screen shots. Rico Torres is a Still photographer for the American Film Industry, and has shot iconic posters for Sin City, Desperado, Predators, Machete Kills, Machete, The Mask of Zorro, Grindhouse, and many more.